Super Erecta Convenience Pak provides a complete shelving unit in a single box. Convenience Pak shelving is the easy-to-order alternative to separate shelving components. 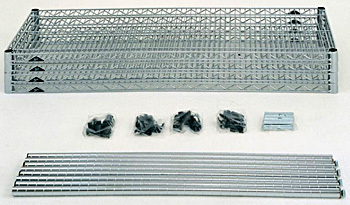 Each pack includes four shelves with split sleeves and four split posts with leveling feet. Each Unit is 74-1/2" High. Adds convenient space above a storage unit. Drop mat design creates a retaining ledge around the entire 12" deep shelf. Remember to order rear posts taller than the front posts to accommodate these shelves.